Steamboat Falls at low flow with spillway (center) and entrance to the fish ladder (bottom, center). Textured concrete "roof" over fish ladder at Steamboat Falls. Top of Steamboat Falls at low flow with water flowing over the constructed spillway. A dam built in 1966 on Steamboat Creek in SW Oregon is scrutinized to reduce sediment and debris clogging the fishway and improve the attraction flow to the fish ladder at a cost of up to $800,000. The Steamboat Falls Fish Ladder on the North Umpqua River is deteriorating. The ladder was originally constructed in 1957 after some blasting in the area destroyed the natural path for fish migrating upstream. It was demolished in 1964 and again rebuilt in 1965-1966. That is the last time it was substantially restored. Today, summer steelhead are making their way up the river. Unfortunately, when they reach Steamboat Falls the steelhead tend to push more towards the spillway due to the attraction flow to that area. The second level of the spillway is far too shallow and fast for the fish, making it an impassable obstacle. One of the reasons the ladder is often less enticing for the fish is that the antique structure gets blocked, primarily during fall and winter. This can slow the water trickling through or halt it entirely, making the ladder virtually invisible to these instinctive creatures. Even when the ladder does flow freely, it cannot compete with the temptation of the spillway. Lead Fish Biologist for the Umpqua National Forest, Jeff Dose, believes most of the fish do find the ladder eventually, evidenced in July by the 60-some steelhead, cutthroat and Chinook up the river at Lee Spencer's Fishwatch station at Upper Bend Pool. The fish just waste valuable time getting upriver. As Jeff stood near the ladder, watching the steelhead attempt time and again to conquer that spillway, he simply shook his head and muttered, "That's not good." He explains that not only is the impossible challenge not healthy for the fish but it leaves them wide open for poaching. "We want them to use this ladder and make their way upstream to Big Bend pool or to another holding area." Efforts to rectify the ladder's shortcomings received a $20,000 kick start in 2009 from Title II of the Secure Rural Schools legislation. At a Rogue-Umpqua Resource Advisory Committee meeting held in 2010, the committee approved another $23,000 to re-design the ladder. The contract will be awarded to the project in March 2011. The Title II funding is just the beginning. A meeting to discuss the options improving the ladder is set for late August. All the dedicated partners will attend the meeting, including Oregon Department of Fish & Wildlife, The North Umpqua Foundation, Steamboaters, and U.S. Forest Service. While there, the partners will deliberate on how to best fulfill their shared goals for the ladder in the most cost-effective manner. Experts are re-designing the fish ladder with two main goals: reduce sediment and debris clogging the fishway and improve the attraction flow to the ladder. Costs will range between $200,000 and $800,000, depending on which of three alternatives are used. Jeff is optimistic about the future for the Steamboat Falls Fish Ladder and it would appear that concrete steps are being made to assure its long overdue revamping. Directions: Steamboat Falls is located on Steamboat Creek approximately five miles upstream from the confluence with the North Umpqua River. At milepost 38.3 on Oregon State Highway 138, turn north on Steamboat Road #38. Drive 5.3 miles to Road 3810, turn right and stay to the left for 0.6 miles to the entrance of Steamboat Falls Campground. The 25-foot falls are near campsites 5 & 6. Below is some additional info and link for the fish passage improvements scheduled for Steamboat Falls in the next few years. The current ladder(shown below) goes through the cement structure on the right side emerging above the falls in the small calm pool. This passage is outdated and prone to blockage. The new plan addresses these issues and will hopefully improve the situation. Steamboat Falls is located on Steamboat Creek approximately five miles upstream from the confluence with the North Umpqua River. A concrete fish ladder at Steamboat Falls was built during the summers of 1958 and 1959 primarily for the purpose of assisting both summer and winter run steelhead to negotiate the falls during periods of low summer flow or higher fall and winter flows. This original ladder was severely damaged by the 1964 flood. The current fish ladder was reconstructed in 1966. The fish ladder has become plugged with debris at least three times over the last 10-15 years to the point where fish passage has been temporarily blocked. The North Umpqua Foundation, with financial contribution from Steamboaters, hired Michael Love and Associates to evaluate the Steamboat Falls Fish Passage issue and provide a geological and economic analysis with alternatives. Their report was published in February 2010 and offered three alternatives: first, demolish portions of the current ladder and reconstruct a new spillway; secondly, excavate bedrock to provide a fishway with pools; and thirdly, develop bedrock pools with concrete weirs. Cost estimates ranged from a high of $1.3 million to reconstruct the ladder of alternative one down to $411,000 for bedrock pools of alternative two. A meeting occurred in early March between the US Forest Service, the ODFW, The North Umpqua Foundation and Steamboaters to discuss the Steamboat Falls fish passage issue. 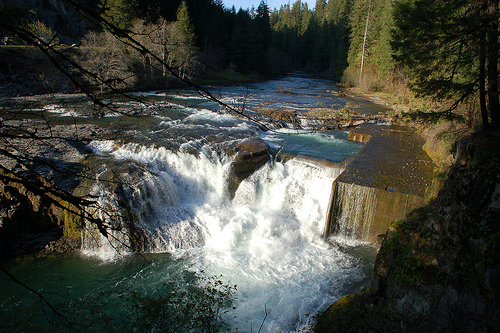 The Umpqua National Forest owns the land at Steamboat Falls while the ODFW owns the existing fish ladder and has an easement for its operation. The Forest Service intends to evaluate the fish passage issue using the NEPA process. As of early April attorneys from both agencies were not sure whether the fish passage project would fall under a categorical exclusion or require an environmental assessment with a decision document. A meeting is set for early May to discuss the technical construction aspects of the project. At this meeting the alternatives proposed in the Michael Love report will be considered in addition to any other potential alternatives. If the NEPA process runs smoothly, forest representatives hope a document would be available for public review by this fall with construction occurring in 2011. During the March interagency meeting, ODFW personnel provided anecdotal information from their historical files dating back to 1946, which suggested winter steelhead might not have negotiated the falls in significant numbers. The winter vs. summer steelhead issue is critical, since the outcome will probably determine construction design based on anticipated river flows and those flow rates amenable to fish passage. Funding of the fish passage project will most likely be from PacificCorp mitigation money in partnership with other organizations. Here is a link to the approved plan,costs and what will be involved over the next few years.